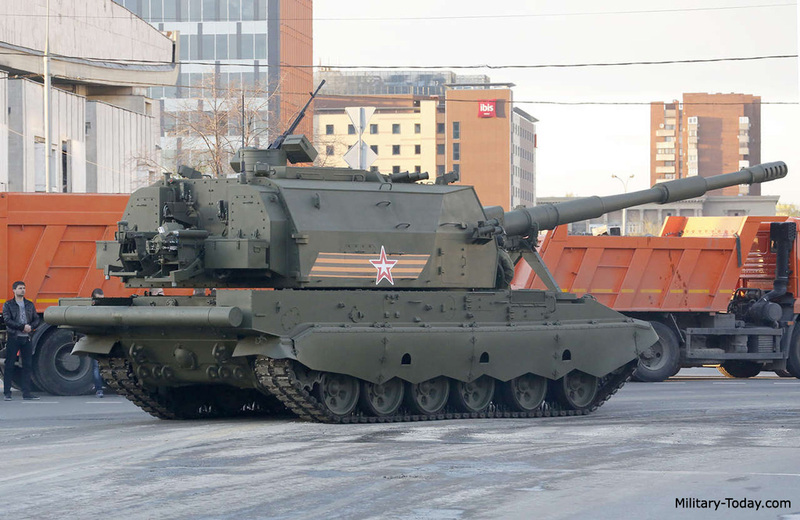 The 2S35 Koalitsiya-SV (coalition) is a new Russian self-propelled howitzer. It is a successor to the 2S19 Msta-S. 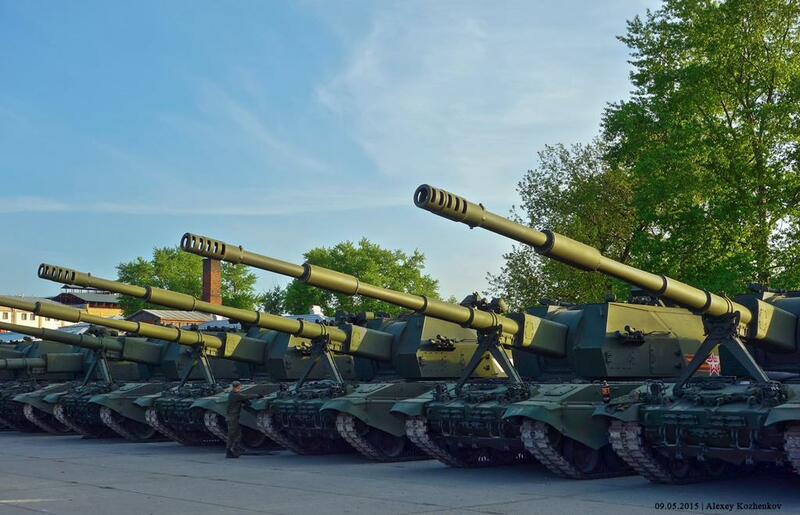 It is also intended to replace ageing Russian 152-mm artillery systems. Currently it is one of the most capable howitzers in the world. The first demonstrator was completed in 2006. This unique self-propelled howitzer had two 152-mm guns. It used a number of components from the previous 2S19 Msta-S. 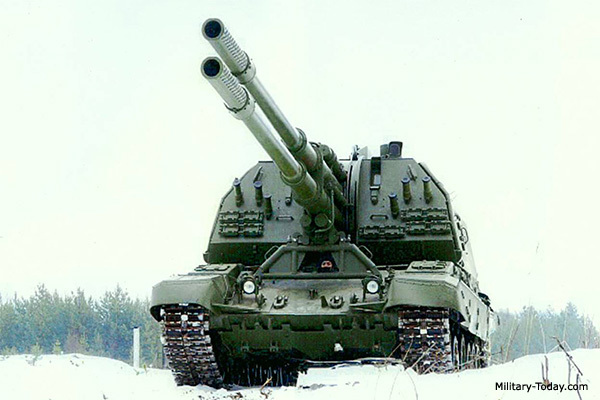 The twin-barrel Koalitsiya-SV demonstrator had a higher rate of fire than current artillery systems. It could fire at around 16 rounds per minute. Even though the Koalitsiya-SV resembles the older 2S19 Msta-S, it is a totally different system. 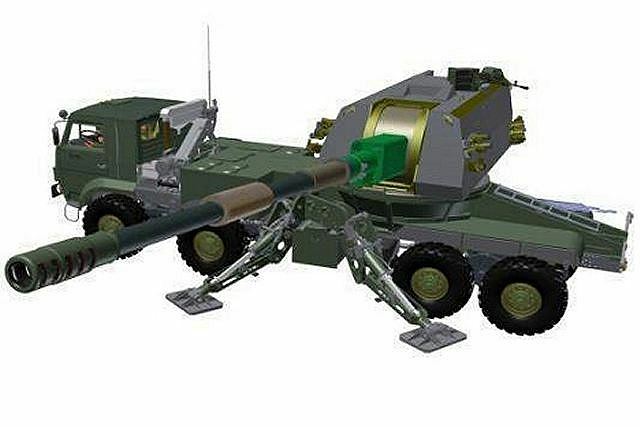 It has unmanned turret and is armed with a 152-mm gun. 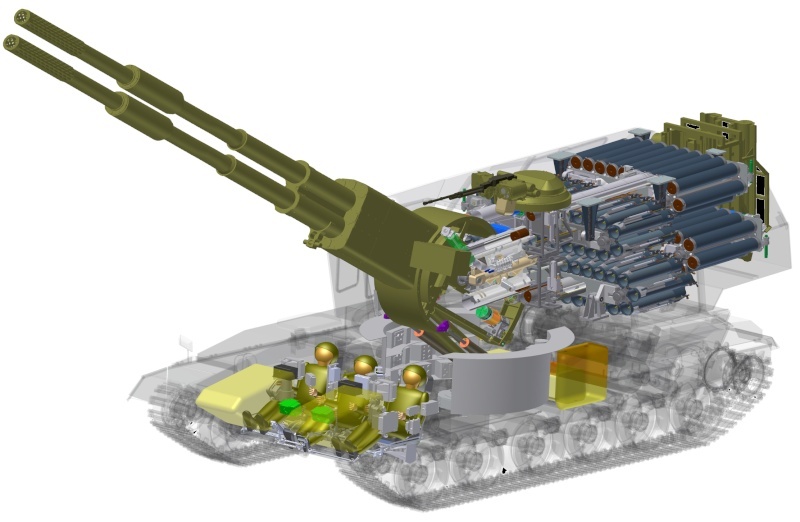 It has a fully automated ammunition loading and handling system. It utilizes a modular charge system. This artillery system can fire a wide range of munitions, including standard and rocket-assisted HE-FRAG projectiles, cluster projectiles with anti-tank submunitions, jammer carrying projectiles. 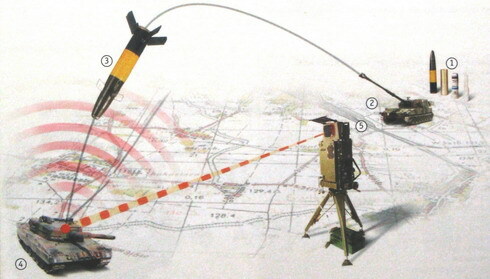 Range of fire with standard projectile is around 30 km and around 40 km with rocket-assisted projectile. 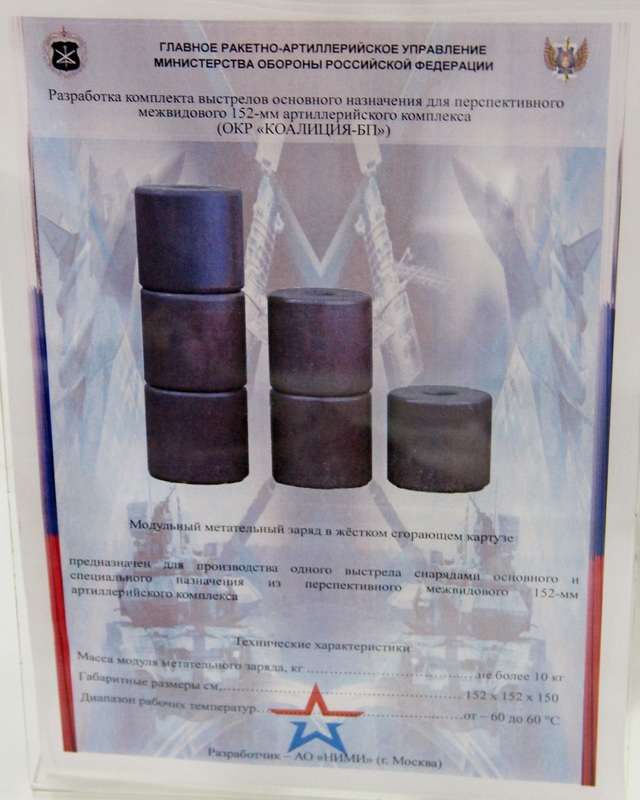 Also in the exposure of the international military-technical forum “Army 2017” it was presented created within the same OCD “Coalition-BP” 152-mm mortar shell with a concrete-3G4. The shot is designed to defeat the field fortification and other defensive structures, infrastructure facilities and the rear. It is used for firing from the 152-mm self-propelled howitzer 2S35 “Coalition-SV”. Shot consists of 3G4 with the projectile fuze screwed bottom, complete variable modular propellant charge 4-Z- 27 and an electric shock tube. Before screwing the fuse, the point is closed by a blank stopper. A new long-range precision-guided round has been developed in Russia. It has a maximum range of 70 km and high level of accuracy. The Koalitsiya-SV It is also capable of firing older Krasnopol precision guided munitions with a range of 20 km. 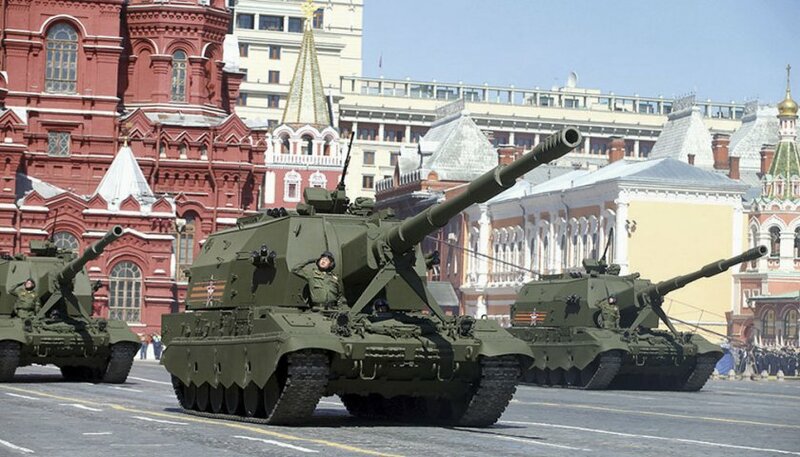 For export customers the 2S35 Koalitsiya-SV can be fitted with a 155-mm gun, compatible with standard NATO ammunition. Maximum rate of fire is around 8 rounds per minute. It seems that the Koalitsiya-SV is capable of multiple round simultaneous impact firing. This artillery system carries impressive onboard ammunition supply of around 60 to 70 rounds. 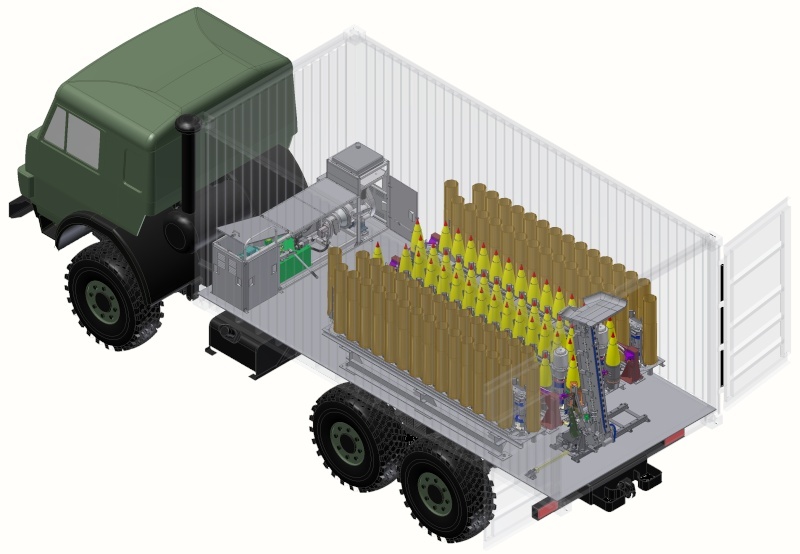 It has a separate ammunition reloading system at the rear of the turret that allows to load ammunition from resupply truck. The Koalitsiya-SV has an automatic targeting and charge selection system. Vehicle has a remotely controlled weapon station, armed with a 12.7-mm machine gun. It can be used for self-defense against air and ground targets. The Koalitsiya-SV has a high level of automation. It allowed to reduce the crew. This artillery system is operated by a crew of only three men, including commander gunner and driver. Crewmembers are located in a well protected compartment at the front of the hull. Armor of this vehicle protects the crew against small arms fire and artillery shell splinters. Vehicle is also fitted with NBC protection and automatic fire suppression systems. 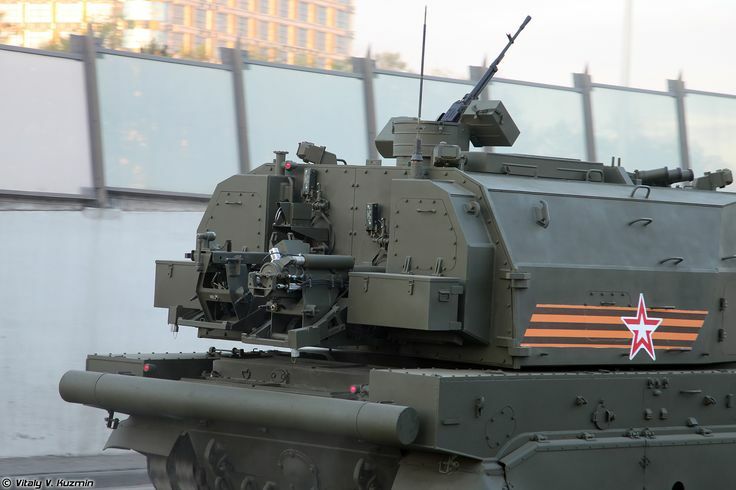 The Koalitsiya-SV uses new tracked chassis. It uses components of the T-90 main battle tank. 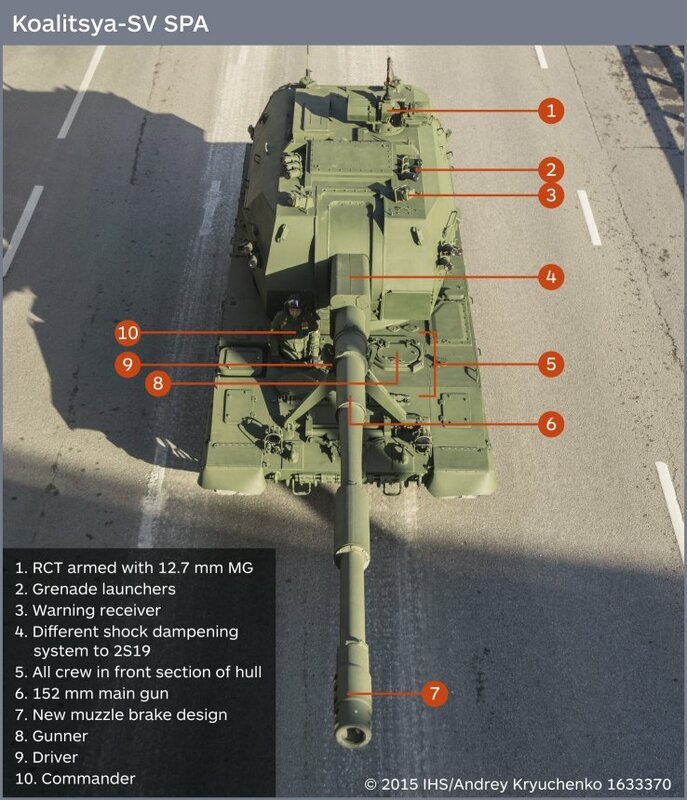 General layout of the chassis resembles that of the T-90, but the front is heavily modified to accommodate the crew. It is likely to be powered by a turbocharged diesel engine, developing around 1 000 hp. Vehicle has a built-in self-entrenching blade and can dig itself a trench within 12-40 minutes, depending on the ground type. It was planed that a wheeled version of this artillery chassis, based on a 8×8 high mobility truck, would be developed. This entry was posted in Uncategorized on October 22, 2015 by nonothai.